Fans of the science fiction series The Hitchhiker's Guide to the Galaxy have gathered to pay homage to the work of author Douglas Adams. Mr Adams, who died in 2001, created the radio series, which subsequently became a bestselling book, television series and film. The events took place as part of the international 42 Day celebration. The occasion takes its name from a scene in the series, in which a super-intelligent computer is tasked with finding "the answer to the ultimate question of life, the universe and everything". It concludes that the answer is 42. Fans of the series gathered across Scotland to mark 42 Day. The date of the celebration - 10/10/10 - is 42 expressed in the binary number system, which is used by computers to store and process information. In Edinburgh, they congregated on the city's number 42 bus, while those in Glasgow gathered in a city centre coffee shop. But it was not just the Scots who celebrated Adams' creation. Similar events have been held across the world, including in Los Angeles, Paris and London. Rob Hannah, organiser of the Glasgow event, said: "Douglas Adams was a ground breaking author for his time and he remains popular because of his particular brand of humour - quirky and very clever. "The Hitchhiker's Guide was very forward-looking; nowadays people have smart phones and iPads, which is like having a guide to the universe in your pocket." The events were arranged by members of the Hitchhiker's Guide fan club ZZ9 Plural Z Alpha. Jim Mowatt, from the group, said: "The response was slow at first, but momentum picked up at a positively alarming rate. "People have been tweeting from all over the world, announcing the start of 42 Day as it enters their time zone. "I feel like a man who was just making a snowball and now finds he has inadvertently constructed a range of mountains." While the 10/10/10 date only occurs once every 100 years, Mr Mowatt said that plans were in place to stage 42 Day again in 2110. The Hitchhiker's Guide to the Galaxy began in 1978 as a series broadcast on BBC Radio 4. 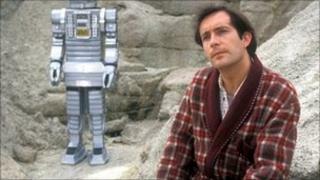 Its plot revolves around the adventures of unassuming Englishman Arthur Dent, who survives the destruction of the Earth. The series continued after its creator's death, when Eoin Colfer, author of the Artimis Fowl novels, was given permission to write a sixth instalment of the series. Adams' other creations include Dirk Gently, an unconventional detective who solves seemingly inexplicable mysteries. An adaptation of the first Gently novel is in the early stages of production for BBC Four, with actor Stephen Mangan in the title role.